It's hot, it's humid, and you're wondering how you are going to get through the rest of the week sitting in your tiny cubicle. Fret no more my midtown minions - Walk on over to Quality Meats (yes, home to the best monkey bread on earth), and try out their ice cream cake sundaes. Still not sold? With flavors including Strawberry Shortcake, Toasted Banana S'more, and Chocolate Covered Grasshopper, not even your lactose-intolerant accounting department could say no. 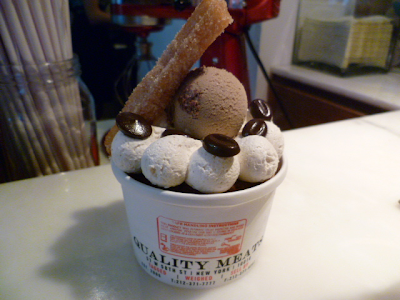 FYI - our team went off the beaten path to try the spicy Mexican coffee ice cream (can you ever have too much caffeine?). Underneath - a spicy chocolate brownie and topped off with cinnamon-tamarind icing and chocolate covered espresso beans. 'Nuff said.